Service handlers (dispatcher or dedicated server) available for each instance, including their type, protocol addresses, and current and maximum load. 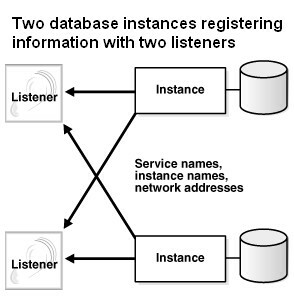 Service registration reduces the need for the SID_LIST_listener_name parameter setting, which specifies information about the databases served by the listener, in the listener.ora file. The SID_LIST_listener_name parameter is required if you are using Oracle Enterprise Manager to manage the database. Because the listener always monitors the state of the instances, service registration facilitates automatic failover of a client connect request to a different instance if one instance is down. When services are configured statically, a listener starts a dedicated server when it receives a client request. If the instance is not up, then the server returns an Oracle not available error message. Service registration enables the listener to forward client connect requests to the least-loaded instance and dispatcher or dedicated server. Service registration balances the load across the service handlers and nodes. The SERVICES command lists the services supported by the database, along with at least one available service handler. Service "oel11g.localdomain" has 1 instance(s). Service "oel11gXDB.localdomain" has 1 instance(s). If the listener is not running when an instance starts, then the process monitor (PMON) cannot register the service information. PMON attempts to connect to the listener periodically, but it may take up to 60 seconds before PMON registers with the listener after it has been started.